Individuality is the holy grail of modern contemporary design. Looking at many of the television programs such as Grand Designs and Home Front, the home is used as an expression of your own style and identity. Flooring has also evolved with this personalised approach to interior decoration. In this article you will discover some of the more unique materials available on the market. 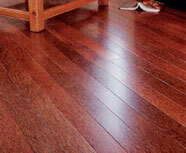 Bamboo flooring is a hybrid product similar to engineered hardwoods. But it’s not wood: It’s a grass. Bamboo stalks are milled into strips, then reassembled as floorboards. The boards are typically 3⁄8 in. or 5⁄8 in. thick, and have either square edges (on unfinished boards) or micro bevelled ones (on pre finished boards). Depending on how the strips are aligned, the flooring resembles either quarter sawn or flat-sawn hardwood. The unmistakable figure of the bamboo nodes adds a visual interest to the “flat-sawn” boards. Pre finished bamboo is available in two colours, natural and carbonised, and in two sheens, high gloss and matte. The carbonised colour shows a lustrous warmth, akin to natural cherry, that would enhance any kitchen. Environmentally friendly, warmth, beauty, available pre finished, hard, durable. Limited colours in pre finished, finish maintenance required, limited product choice. This newcomer is milled from the dark wood of the coconut palm. Developed by Smith & Fong, Durapalm is a 3⁄4-in. thick, 72-in. long, 3-ply tongue-and-groove floorboard that is 25% harder than red oak. It is free of formaldehyde and VOC emissions. Durapalm is available both unfinished and pre finished. The latter type uses the ceramic system of embedded particles to prolong finish life, which is warranted for five years. The edges are micro bevelled; the colour choices are a medium mahogany and a dark brown. The installation methods are the same as used for other hardwoods, and so are care and maintenance. Why use it? It has the same benefits as sustainably harvested wood, along with an alluring colour, warmth and figure. This material is gorgeous, but will it work for you? It has some great qualities, and some not-so-great ones (“Pros/Cons, below). It is manufactured now in a host of heavenly and earthly colours, patterns and textures. But a lack of demand means that manufacturers’ distribution networks aren't geared to sell most rubber flooring at retail. Flexco is an exception. 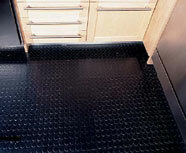 Its Repel rubber flooring is formulated to resist grease, and it’s sold in retail stores. Repel is available in 12-in. and 18-in. 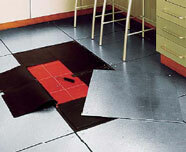 squares, which can be heat welded together following installation. Install using their solvent-free adhesive. Resilience, durability, insulates, quiet, comfortable underfoot, traction, low price. Can be harder to find sources, fewer choices, dull finish, grease/oil can stain. No surprise that this high-style floor is made in Italy. I understand it’s the flooring choice in at least one showroom there: Ferrari. If it can hold up to cars, it likely will hold up to foot traffic in even the busiest kitchens. Manufactured in 18-in. sq. and 24-in. sq. panels, each piece of stainless flooring has a raised pattern, all the better to slow skids. A custom underlay of interlocking rubber squares cushions and guides panel installation. The combined thickness is less than 7 mm. The steel panels do not attach to the subfloor; they are screwed to the rubber underpayment with Phillips-head screws (made of stainless steel) in predrilled holes. Another ambassador from green land, cork (like linoleum and bamboo) originates from a natural source not endangered by its harvesting. Cork tiles are made of the bark of the cork oak tree, bark that can be peeled off every decade (the trees live to be 150 years old). Frank Lloyd Wright liked cork, and he installed it in houses where it endures today. Contemporary cork floors now are sealed with UV-cured acrylic or water-based urethane sealers. Neither water nor oil penetrates the sealer. What’s more, you literally are walking on air: Cork tiles contain 200 million air cells per cu. in. Traditionally, cork floors have been made from 12-in. sq. tiles, up to 5⁄16 in. thick, in the familiar honey colour. Those tiles are still available, but manufacturers have broadened their offerings. ContempoCork has tiles in more than a dozen stain colours. KorQinc makes a striped plank in a choice of two colour duos, as well as tiles and moldings. AmCork offers cork flooring in more than 30 patterns and colours. Because of cork’s thirsty, expansionist tendencies, moisture is the crucial concern. Experts recommend installing cork floors at the driest time of year. After installation, cork floors should be finished with the manufacturer’s recommended sealer to ensure that the edges of the tiles or planks are sealed thoroughly. 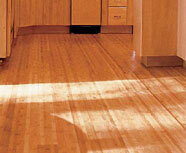 To keep them clean, damp-mop water-based urethane finishes with a water-and-vinegar solution.